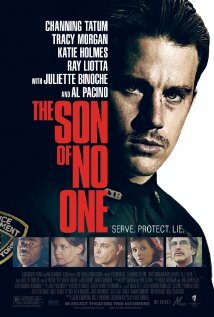 The Son of No One is a police thriller about a young cop who is assigned to a precinct in the Queens neighborhood where he grew up. To provide for his wife and ailing daughter, he works hard to keep his life on track. But this life is threatened when a dark secret bubbles to the surface. An anonymous source reveals new information about the unsolved murder of two boys and a possible police cover-up, setting off a chain of events that rattles the neighborhood.